Israel is going to remember the Holocaust victims next week, and this time, I am also planning to write something in English and not most of the articles in the German language. Hundreds of thousands of Chassidim died in the Holocaust and especially the Chassidim themselves don't really write about the subject. One famous example suffering through the Holocaust was the Klausenberger Rebbe Yekutiel Yehudah Halberstam. The Satmarer Chassidim insist on mentioning their founder Rebbe Yoel Teitelbaum although he got out on time on the Kasztner Train. The first wife of his nephew Moshe, however, was killed in Auschwitz. Another group always referring to their previous Rebbe when it comes to the Holocaust are the Belzer Chassidim. I think it is FELDHEIM publishing a book about Rebbe Aharon Rokeach and his escape from the Gestapo. Nevertheless, hardly any other Rebbe is so full of doubt when it comes to the Shoah. Did the Belzer Rebbe intend saving the lives of his Chassidim and was he really such a great hero ? I have been collecting some material and perhaps it will bring some light into all kinds of accusations. This Shabbat I am going to spend in Jerusalem and hopefully I will make it to the Belzer Tish starting at 11pm. I haven't been there for quite a while and this is the reason I am going. The Belzer are extremely organized and the entire Tish is perfectly arranged. I've been reading about the Shoah in the Ukraine. I cannot comprehend the total destruction of the Jewish population in just under two years. The majority were slaughtered by bullets. The town were my great-grandfather and grandfather came from, Nemirov, no longer exists. It is also the town were the Breslov Rabbi Nosson is from. When you visit all the former Jewish communities in Eastern Europe today, all what is mostly left are cemeteries. Sometimes even not the original synagogue, as they were either destroyed by the Germans or turned into a cinema, gym, etc. by the locals. Shabbat Shalom from Jerusalem ! Please report on the Belzer tisch. I wish I could go back. It was a surprise for me. Before Belz I had only known Stolin and Skver, where things could get pretty wild. I was was surprised that there was such an aura of calmness at Belz. What I realized later that there was a certain kedusha in the air, which I didn't feel the first time, unfortunately, but I would love to go back and experience what I think I missed. 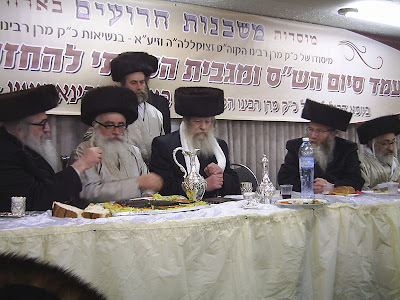 http://shearim.blogspot.com/search/label/Tish%20-%20Guide%20JerusalemThe Belzer always treat their Rebbe as a real King. Each of the Chassidim has his particular place and the Rebbe hands out food (Shirayim) to one of each groups of Chassidim standing at the Tish. There is definitely a feeling of Kedusha but I am unable to describe it with words. Belz is indeed nice, but I also found that there was great kedusha at Boyan! 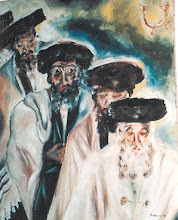 "Day of the Bones - Yom HaAzamot"
Ignoring the Sirens - Haredim and "Yom HaShoah"
Is my Soul getting lost ? "The Mythmaker - The Invention of Christianity"
The Edah HaCharedit and the "Birkat HaChama"
Today's "Splitting of the Sea"
Is this MODESTY or DISINFORMATION ?